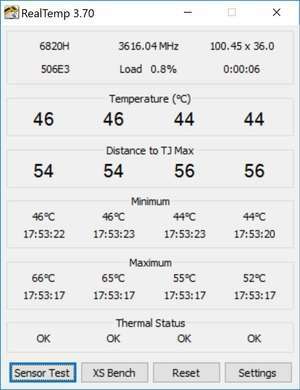 RealTemp is a temperature monitoring program designed for all Intel single Core, dual Core and quad Core processors. Each core on these processors has a digital thermal sensor (DTS) that reports temperature data relative to TjMax which is the safe maximum operating core temperature for the CPU. As your CPU heats up, your Distance to TjMax will decrease. If it reaches zero your processor will start to throttle or slow down so obviously maximizing your distance away from TjMax will help your PC to run at full speed and more reliably too. Version 3.70 is a freeware program which does not have restrictions and it's free so it doesn't cost anything. For security reasons, you should also check out the RealTemp download at LO4D.com which includes virus and malware tests. Additional screenshots of this application download may be available, too.